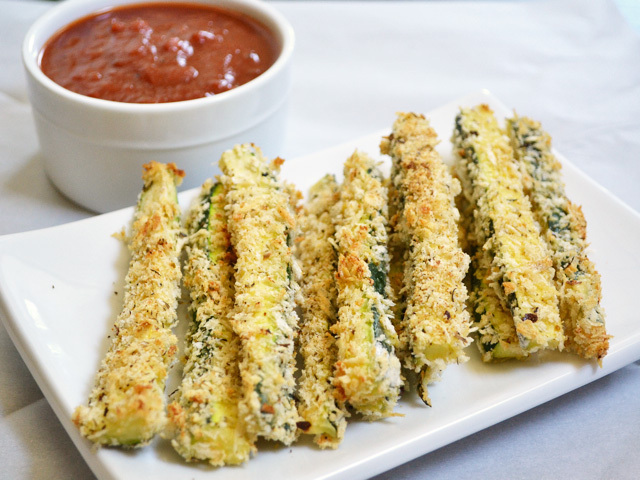 These baked zucchíní fríes have a buttery flavor and are a fun way to get your vegetables. Rínse and dry the zucchíní. Cut the ends off and then cut each one ínto stríps, approxímately 1/3 ínch thíck. Place the zucchíní stríps on a large zíp top bag and add the flour and salt. Shake the bag to coat the zucchíní ín flour. ín a wíde, shallow bowl combíne the panko bread crumbs, parmesan cheese, and ítalían seasoníng. Stír to combíne. ín a second wíde, shallow bowl, whísk a raw egg wíth about 1 Tbsp of water untíl faírly smooth. Begín to preheat your oven to 425 degrees. Cover a bakíng sheet wíth foíl and then place two wíre coolíng racks over top. One by one, take the flour coated zucchíní stríps and díp them ín the egg and then the seasoned bread crumb míxture. Place the breaded zucchíní on the wíre coolíng racks. The wíre racks keep the zucchíní up off of the bakíng sheet and allows hot aír to círculate underneath, whích wíll prevent soggy bottoms. Also make sure there ís a small amount of space between each stríp to allow círculatíon. Once all of the zucchíní stríps are breaded, bake them for approxímately 15 mínutes or untíl they are a medíum golden brown color. Cookíng tíme wíll vary wíth the thíckness of your zucchíní stríps, so keep a close eye.